Went camping with Gil, my sis Elaine, Chuck, Robert, and our pooches Yuki and Pookie at Boulder Basin in the San Bernardino Forest (about 14 miles north of Idyllwild) back in July 1997. At over 7,300 ft elevation, it sits in a fairly secluded, pine forested location, with lots of boulders around (hence the name, Boulder Basin). The sugar and ponderosa pines provided lots of shade and privacy between campsites, although our particular campsite was a bit too shady, even for summer, as it got a bit chilly towards evening. 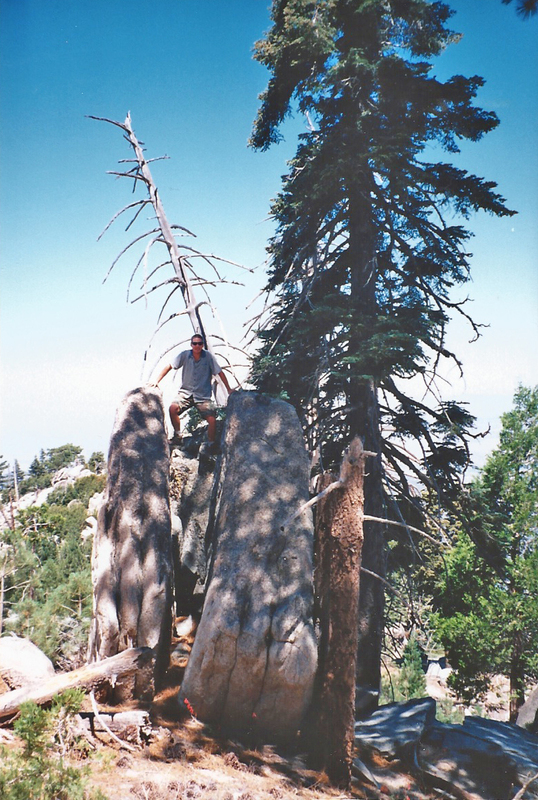 Very popular place with mountain bikers, hikers, and rock climbers, so reservations are highly recommended. 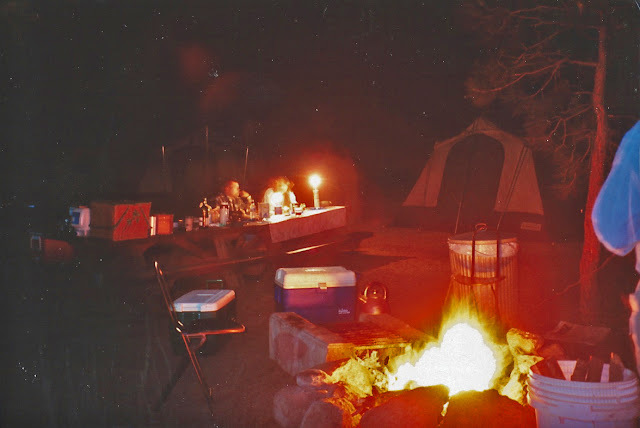 Before heading up, you should always call or check the U.S. Forest Service's website for campground closures due to winter weather or fire hazard conditions. NOTE: From Hwy. 243, you'll turn off on Black Mountain Road (4S01) and drive about 6 miles to the campground. Black Mountain Road is a rather rough, narrow (one lane), winding dirt road that would be best traversed by a higher clearance 4WD vehicle, although I'm sure it's passable by a 2WD. Trailers are definitely not recommended. 7/20/97 Black Mountain Trail, Boulder Basin. 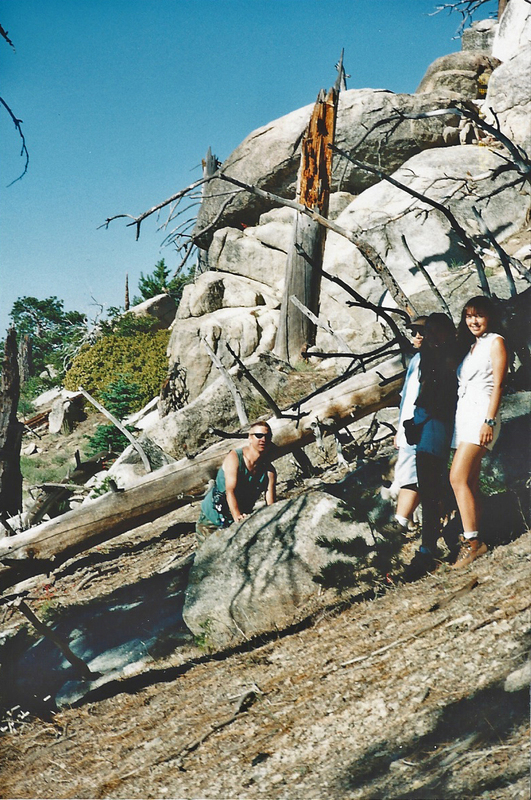 7/19/97 Our campsite at Boulder Basin. Yuki, our Akita, is exploring the grounds. 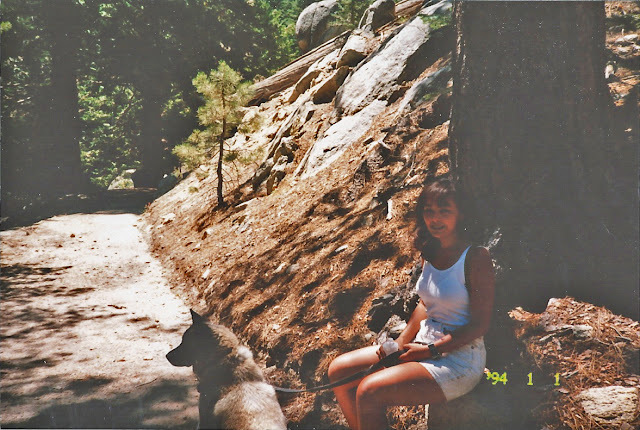 7/19/97 Taking Yuki for a walk. 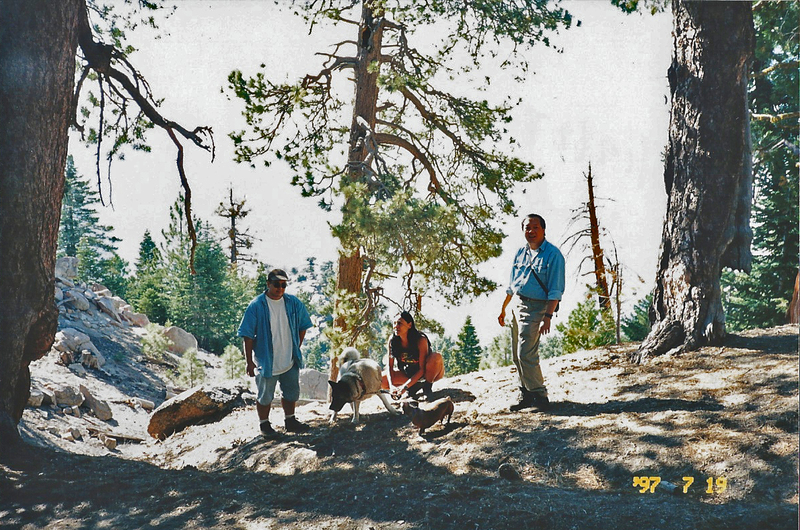 7/19/97 Robert, Pookie (Elaine's mini Dachshund), Elaine & Chuck on Black Mountain Trail. 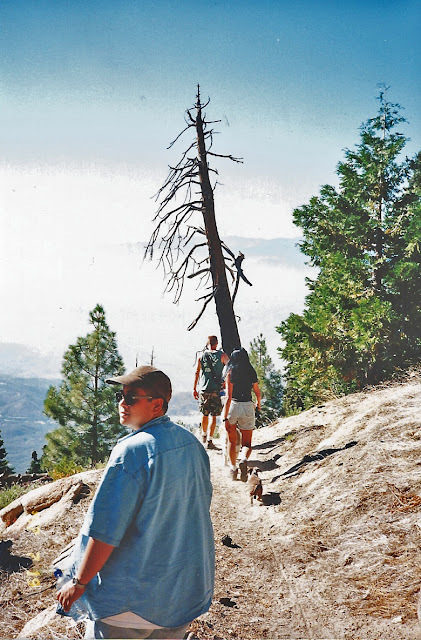 7/19/97 Me, Robert & Chuck on Black Mountain Trail. 7/19/97 Gil & Chuck. Black Mountain Trail. 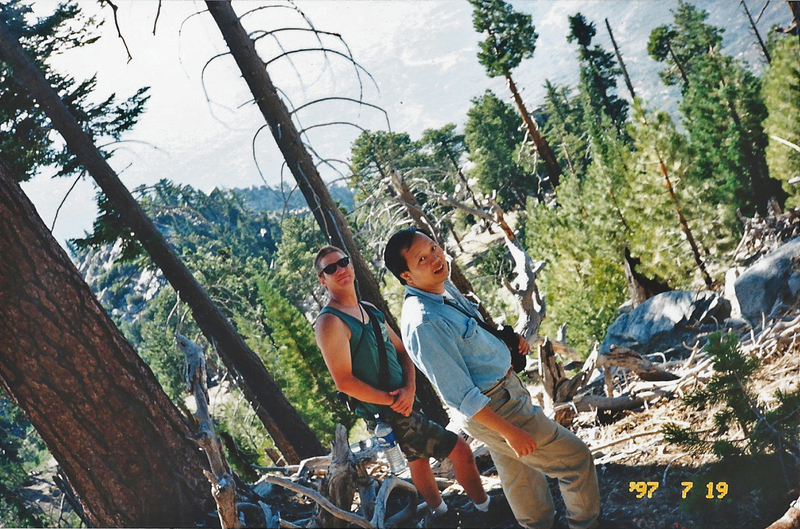 7/19/97 Gil, Elaine, Pookie, Yuki & Robert. Black Mountain Trail. 7/19/97 Elaine & Pookie. Black Mountain Trail. 7/20/97. Me & Yuki, taking a break. Black Mountain Trail. Btw, the date is wrong on the photo. 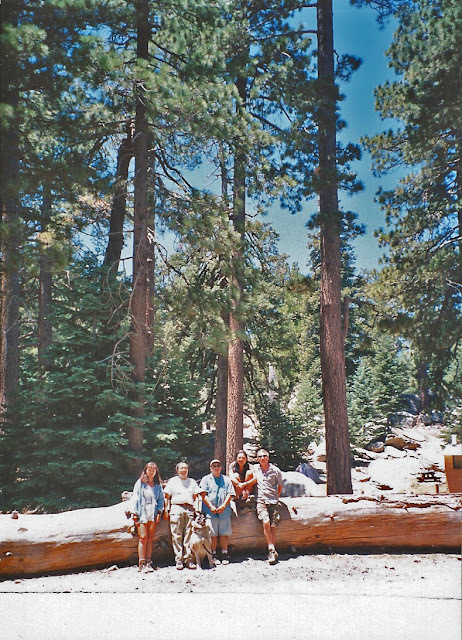 7/20/97 Chuck, Elaine, Robert, Gil & Pookie, and me. Boulder Basin campground. 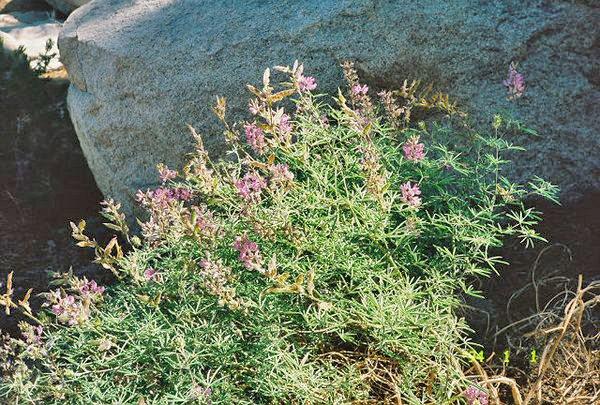 7/20/97 Lupine. Black Mountain Trail. 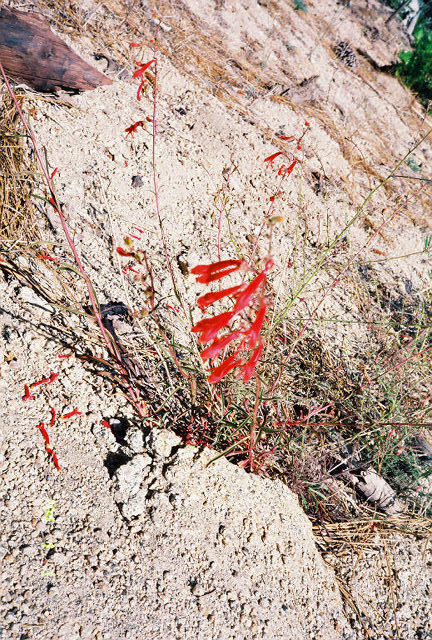 7/20/97 Eaton's Penstemon (Penstemon eatonii)? 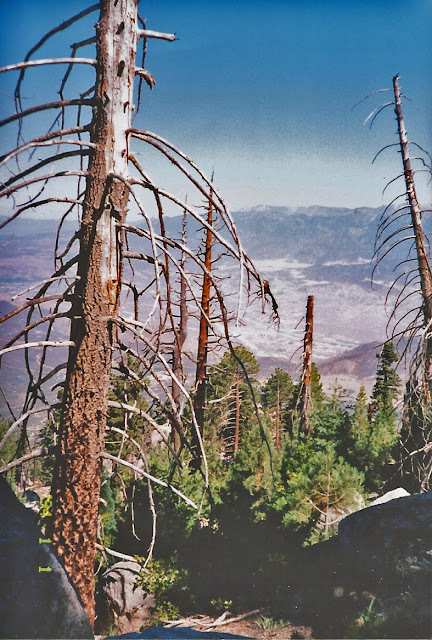 Location: San Bernardino National Forest, San Jacinto Ranger District, 50 miles southeast of San Bernardino, 14 miles north of Idyllwild. Directions: From I-10 in Banning, exit Hwy. 243 south (to Idyllwild). About 9 miles before Idyllwild, turn right on Forest Service Road 4S01 (Black Mountain Rd.) and drive 6 miles to the campground. Road Conditions: Forest Service Rd. 4S01 is dirt and narrow - 4WD recommended. Campground roads and spurs are unpaved. Trailers not recommended. 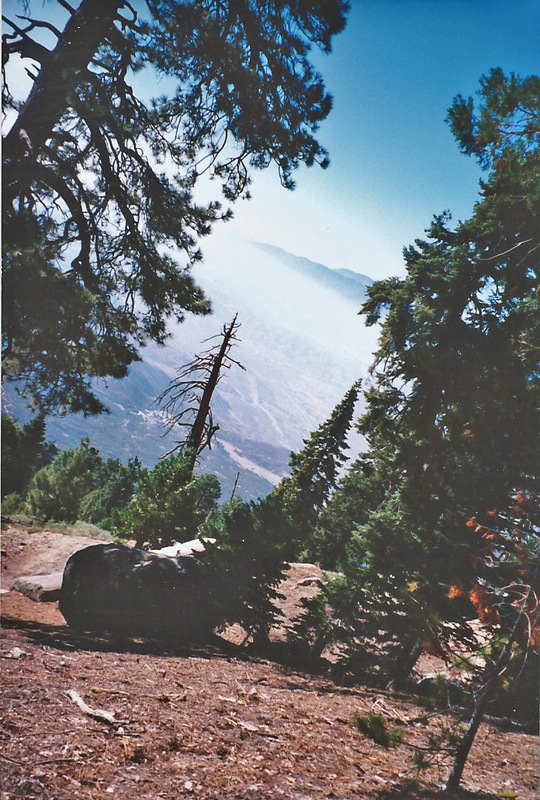 Trails: Black Mountain Trail is an upside down hike from the campground, 3 1/2 miles down to Hwy. 243. Very scenic but strenuous on the return hike back up. Pacific Crest Trail is also nearby. NOTE: A FOREST ADVENTURE PASS IS REQUIRED TO PARK IN THIS AREA (I believe, including the campground). 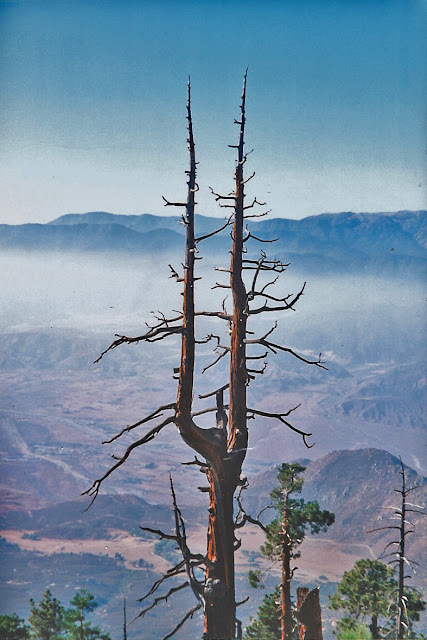 Amenities: Lodgings, restaurants, supplies, groceries, services in Idyllwild. Pine Cove, also off Hwy. 243, is a little closer to Boulder Basin than Idyllwild and has gas & some groceries. Visitor Center: USFS ranger station: San Jacinto Ranger District, 54270 Pinecrest, POB 518, Idyllwild, CA 92549. Tel (909)382-2921. 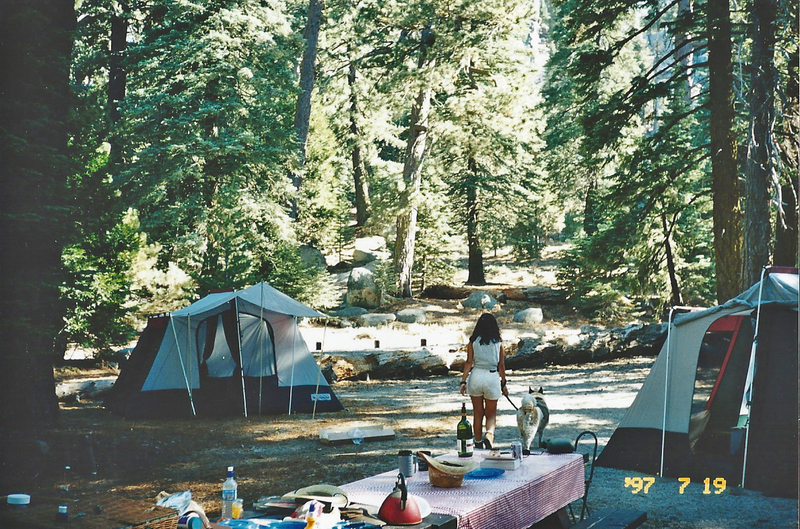 Camping/Fees: 34 campsites with picnic tables & fire rings; vault toilets. No water or firewood available. $10.00/night, maximum of 8 people and 1 vehicle. $5.00 for each additional vehicle. On major holidays, you must reserve your site for a minimum of 3 days. There are a number of first come first served sites. 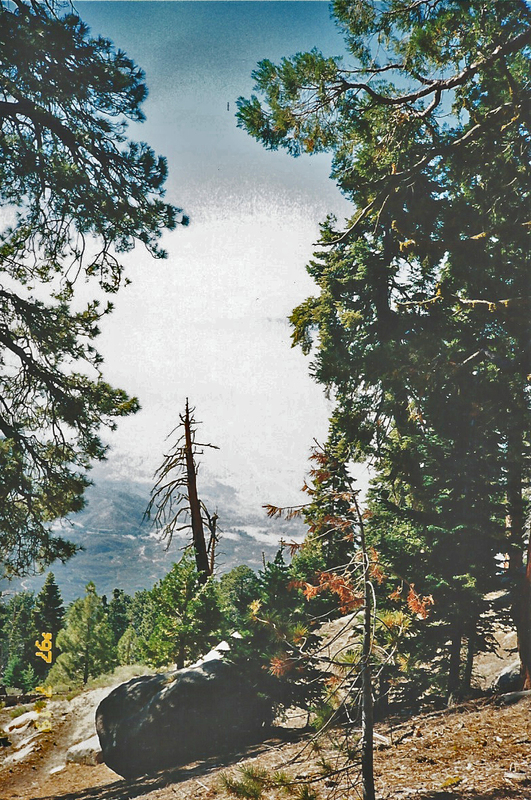 Call the ranger station in Idyllwild ahead of your trip for closures and/or fire conditions. 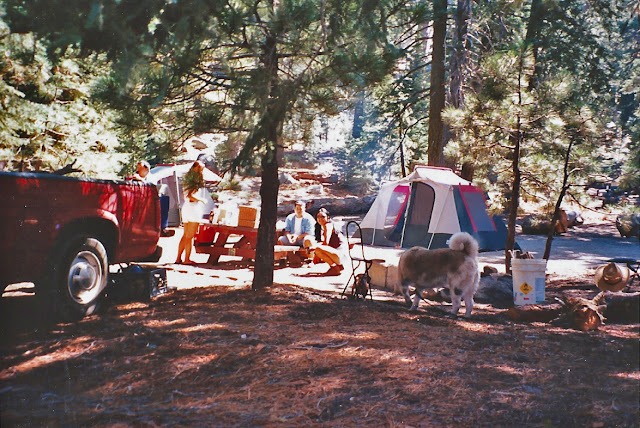 Hours: The campground is closed during the winter season (usually opens in late May and closes early September). 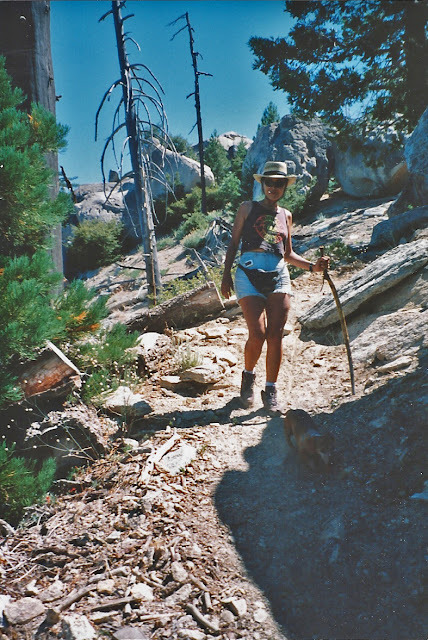 Pets: Dogs allowed on leash in the campground and on the trails. Flora & Fauna: On our trip to Boulder Basin, we saw incense cedars, sugar & ponderosa pines, ferns, Eaton's penstemons & lupines.